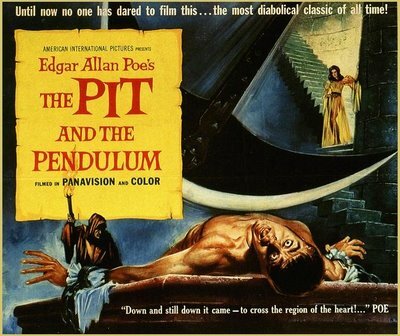 The most famous Edgar Allan Poe movie adaptations are those made by Roger Corman for American International Pictures in the 1960s. Corman made six Poe films: House of Usher (1960), The Pit and the Pendulum (1961), The Premature Burial (1962), Tales of Terror (1962), The Masque of the Red Death (1964) and The Tomb of Ligeia (1964), as well as two films, The Raven (1963) and The Haunted Palace (1963) which use Poe’s poems as a framing device. 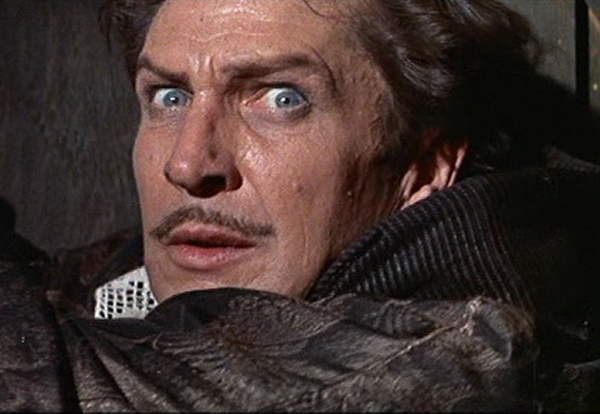 Vincent Price starred in most of these movies and Price came to embody the Poe protagonist: insane, corrupt, murderous, yet eloquent and poetic. In the most famous of Poe’s tales (i.e. the ones most of us still read and are taught in school), he explores the Gothic. And this is what Roger Corman puts on film. If you like your Poe gothic, these are the films for you: haunted mansions, dungeons, ancestral curses, supernatural revenants, brooding and dangerous Byronic heroes. We have all the gothic tropes here. The beautiful, vulnerable young woman, a desolate landscape, the ancestral curse, “the plague of evil.” The scene serves as a microcosm of a gothic tale that hits on many of the features of the genre and is just so well done. Those paintings were done by Burt Shonberg and were commissioned by Corman for the film. A beautiful touch in the richest of his Poe adaptations. Corman also updates Poe’s tales of terror by attempting to find their subtext. He was obsessed with Freudian psychology. Corman himself has said that he is interested in exploring the interior of the mind, the unconscious that drives us. When you read Poe’s stories they seem well ahead of their time. The “unconscious” is not a term used by Poe, but he clearly alludes to a part of the mind that controls our desires (check out the “The Imp of the Perverse”) and Poe clearly states his desire to explore the mind and its creative faculties as well as its fears. Corman too mines the unconscious. 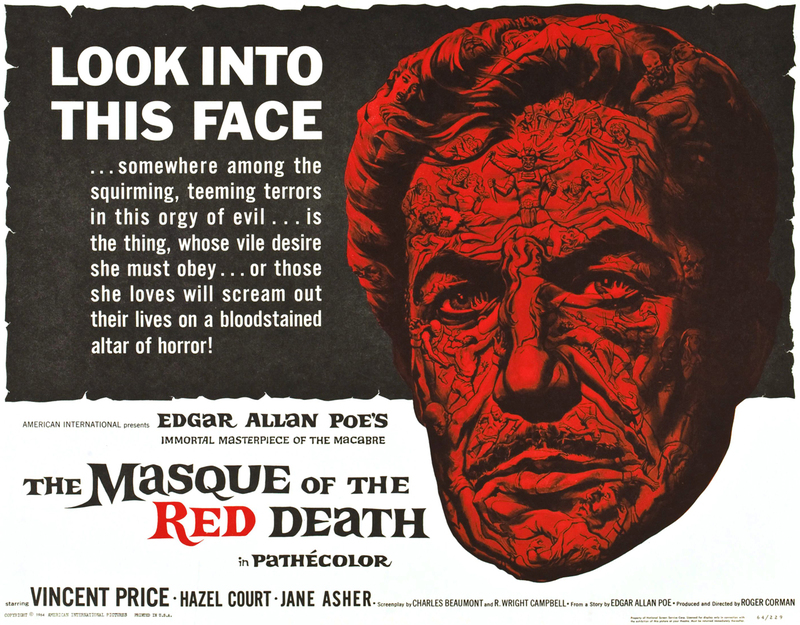 In The Masque of Red Death, Vincent Price as Prospero gives Francesca, a woman he has abducted and wants to corrupt, a tour of his decadent castle and it’s many-colored rooms. He tells her, “Somewhere in the mind my dear Francesca is the key to our existence. My ancestors tried to find it, to open the door that separates us from our creator.” Exploration of the mind, of the unconscious as we say in psychoanalytic terms, is an opening of doors. “For the uninvited there is much to fear,” Prospero continues. Corman reinforces this exploration of rooms of the mind later in the film when Francesca goes into the dungeons of Prospero’s castle to find and free her father and her lover. Francesca must open the doors to rooms and face her fears. What she finds is terrible to behold, but she is temporarily rewarded when she finds what she is looking for. Then, there is a violent struggle in order to leave that deep, dark, terrible place and in the end no reward, only a promise of more explorations to come. Like all of his films, Corman found a formula for his Poe films and he used it over and over again. Almost all of these films open with a blasted heath, a mansion or castle, someone asking admittance to said mansion, at first refused then allowed entrance. The house/mansion/castle always has a basement/crypt/dungeon which is explored by the hero or heroine. A beautiful girl usually dies. The best thing Corman does in his Poe adaptations is tell a spooky gothic story. And like Poe, he does it well. im loving these. keep going!! !